This election has been nothing short of bizarre. On the Democratic side, a relatively obscure self-declared socialist from Vermont almost snatched the nomination from one of the best-known politicians on Earth. Even stranger, on the Republican side, a celebrity tycoon defeated no fewer than 16 career politicians, including one with two presidents in the family, to be crowned the GOP presidential nominee. The Republican victor’s name, as you can’t not know, is Donald J. Trump. His campaign, ever beset by headline-hogging scandal, has divided the nation. Where half of America wouldn’t touch him with a barge pole, roughly 44 percent are willing to believe he offers salvation. There’s little evidence to suggest Trump is truly in this to save America. He’s been labeled a sociopath, a narcissist, and someone who values celebrity and status above all else never a good man. Never a man who actually cares about others, who gives charitably, who exhibits compassion towards those less fortunate. Throughout his campaign, we have seen Trump maneuver and evolve according to whatever will him support that day. Sensing the climate, he has piggybacked on the anger of white working and middle class voters in an effort to win what he probably considers little more than a popularity contest. Like some televangelist, Trump bellows comforting words people want to hear, then asks for their faith solely so that he might increase his own power. Which isn’t to say we can dismiss Trump completely. According to polls, a majority of Americans think the country is heading in the wrong direction – and they’ve been feeling this way for years. On globalization (Americans are among the most skeptical in the world regarding free trade), wealth and employment (71 percent think the US economy is rigged), and the political process, US voters are increasingly cynical. On the left and in the middle, it’s common to simply dismiss the Trump supporter as dumb or racist (or, if you’re Bill Maher, you’ll insist sight unseen that Democrats have nothing in common with these “deplorables”). But wade through the toxic ocean of xenophobia, racism and misogyny, and you’ll find the issues that are so deeply worrisome for average Americans. Most, if not all, of these issues are cornerstone concerns of the Trump campaign. Sure, Trump’s solutions to these problems are vague, but to a lot of frustrated Americans it simply matters that Trump is talking about the kind of change they’ve been thirsting for. Some are lending their support to Trump through sheer disdain for Hillary Clinton alone, but for the most part Trumpeteers are just happy to have found a presidential candidate who seems to distrust the powers-that-be right along with them. They apparently share a desire to see the establishment shaken—a feeling that actually transcends the two main parties. As John B. Judis points out in his essay “Us v Them,” populism is not exclusive to the right-wing, but is in fact a political ideology separate to both right and left. Indeed, in this election, populist policies have proven popular with Republican and Democrat voters alike. 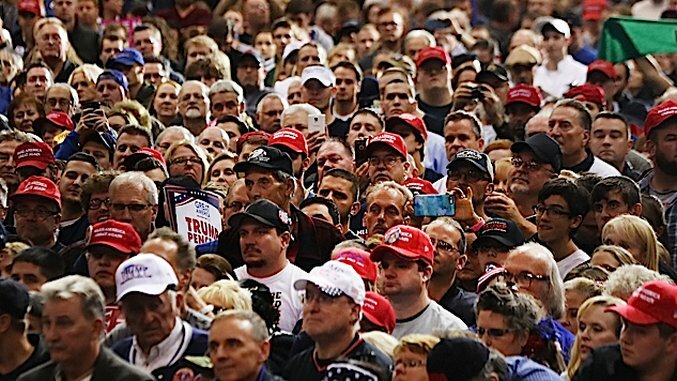 The Guardian’s Sarah Smarsh has argued that it’s not racism nor stupidity that drives so many to support Trump, but the feeling of being left behind by the establishment. It was this same feeling among Democratic voters that almost bagged Bernie Sanders the nomination. The difference is that while media commentators dismiss Trump’s anti-establishment message—and by association, his supporters—Bernie Sanders’ own populist agenda is now influencing Clinton and the DNC. A concern is that, though millions of voters left-to-right across America are clearly troubled, Clinton’s new lightly progressive platform might not go far enough to appease them should she become president. As we near the end of this long, long election year, it’s tempting to just try and put it all behind us. Those on the side of the Democrats, including in the press (positively sighing with relief that the polls show Clinton ahead), seem happy to no longer make this about policy or voter concerns, but about making that killshot; about finally defeating Trump, and getting this election the hell over with. As tempting as it will be to settle into four relatively quiet years after this entire exhausting process, we must acknowledge that some of the foundation concerns of Trump’s supporters are 1) legitimate, and 2) aren’t suddenly going to go away on November 9th. And if in four years no real progress is made in those areas of very real concern, then America’s fiercely disillusioned voter base may be only too ready to welcome a Trump 2.0 in 2020. Once Trump disappears, he leaves a vacuum, just waiting to be filled by someone who talks the same talk. Though he’ll no doubt think otherwise, Trump’s pundit-defyingly successful run hasn’t proven how adept he is at politics—it has highlighted just how much a huge portion of the U.S. is willing to overlook in order to get some radical change. A slew of scandals have slowly, slowly driven down Trump’s poll numbers, but even in some of his lowest moments he has polled in the lead. A ‘polite’ Trump, one less gaffe-prone and with a less sleaze-filled history, might have found the ever-unpopular Clinton easier to beat. Though nothing is certain, right now it appears more likely that Clinton will win. This year, the American establishment probably got lucky. Across Europe, right-wing groups have lately taken advantage of anti-establishment sentiment much quicker than the center and left, and have made gains for it. What the Democrats have with a potential four years of President Clinton is a second chance. With that, they must look past Trump’s nasty, often incoherent campaign and accept the fact that some of the issues he has been talking about actually need addressing. The people of the UK, also angry about being left behind economically and feeling ignored by the political class, just committed a grand act of self-immolation with the Brexit vote. If in four years Clinton and team don’t tackle America’s own areas of high voter concern—wealth and income inequality, lack of corporate accountability, a political process even 39th president Jimmy Carter thinks needs a reboot—the risk will be allowing for another ‘outsider’ opportunist like Trump to enter the White House. Democrats on Clinton’s side, like Bernie Sanders and Elizabeth Warren, propose simple answers, progressive answers that offer society a little more breathing room financially and help get big money out of politics. Opportunists like Trump, yelling about deporting immigrants and cutting taxes for the already-wealthy, on the other hand offer ‘solutions’ that would send America into a spiral that could take years to arrest. Trump doesn’t have this much support simply because his fans are to a man ‘stupid’. They don’t all really think he’s going to make anything Great Again. In the US, as in the UK, many voters are just angry, and they’re ready to prove it by burning down the house. Clinton and the establishment have to decide whether controlled change from within is preferable to another ‘outsider’ like Trump offering a more dangerous revolution four years from now.